Nasal endoscopy is a simple, in-office procedure that allows the doctor to examine the interior of your nasal passages and the openings to your sinuses. 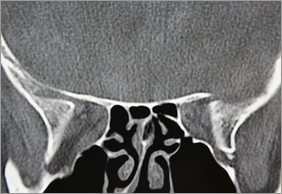 Nasal endoscopies work together with CT scans to help the doctor make an accurate diagnosis. While an endoscopy offers the doctor a view of your nasal cavity, a CT scan offers a view inside your sinuses and of the unique structures within your head. When you put the two images together, it provides the complete information necessary to diagnose your individual problem and determine the best steps to take in your care. An endoscope is a small and thin (less than the size of a pencil) rigid or flexible viewing tube with a light on one end and an eyepiece or camera attached to a video monitor on the other end. It is used to look through small holes into larger spaces. Endoscopes are used by many types of doctors to evaluate spaces within the body including the lungs, stomach, nose and sinuses. In addition, ENT doctors use endoscopes to look at the vocal cords and other throat tissue. Nasal endoscopy is commonly performed within the office. Before a nasal endoscopy the staff will spray your nose with a topical decongestant, to reduce the swelling and widen the path for the endoscope, and a topical anesthetic, which numbs the nose and helps decrease the chance of sneezing. The procedure is not usually painful, but some patients experience discomfort from the pressure of the endoscope. More numbing spray or a pediatric scope may help with such discomfort. Nasal endoscopy allows a detailed examination of the nasal and sinus cavities. During the endoscopy, the physician or other certified provider will look for areas of swelling in the mucosal membranes, for the presence of purulent secretions draining from the sinus openings, for enlargement of the turbinates, and for the presence of polyps. If pus is seen, it may be sampled to determine what organism is causing the infection. Nasal endoscopy is the most important diagnostic exam that an ENT will need to help with determining what may be causing sinus problems. A transnasal flexible laryngoscope can be used for office-based diagnostics. This office exam is extremely well tolerated and often performed multiple times per day to patients of all ages. This can even be performed on newborns if medically required. Prior to passing the scope, the patient's nose is decongested and anesthetized with topical sprays that do NOT sting or burn. The patient then sits in an upright position and the scope is passed along the floor of the nose into the back of the throat to a level just above the vocal cords. At this point the patient is asked to breath deeply and phonate, allowing the physician to directly observe the structure and dynamic motion of the true and false vocal cords. There are no lasting side effects to this procedure and the anesthetic spray wears off over the ensuing 1-2 hours. Common reasons for performing this procedure during your visit include hoarseness, suspected vocal fold lesions, chronic shortness of breath, difficulty or inability to swallow, longstanding history of smoking, the need for postoperative visualization or tumor surveillance, and inability to otherwise visualize the vocal cords during the exam.